For more than thirty years, Allergy Research Group® has been known for the highest quality, most hypoallergenic, and most cutting-edge nutritional supplements available. Physicians and healthcare practitioners around the world depend on ARG for their patients’ nutritional support. Originating with the ground-breaking oxidant/antioxidant work of Stephen Levine, Ph.D., Allergy Research Group was one of the first to introduce truly hypoallergenic products to the market. Since 1979, Allergy Research Group® has used only the purest raw materials available, and has implemented strict quality control procedures in every stage of production, including inspection of raw materials, manufacturing, packaging, and storing. ARG is licensed by the California Department of Health Services, Food and Drug Branch, registration number 0021150. 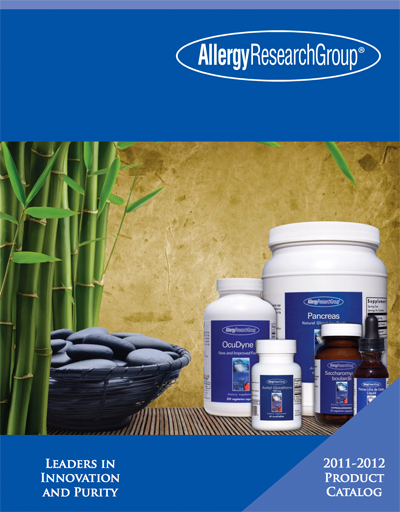 Allergy Research Group uses only the purest and highest quality raw materials available. For example, we use only Nattokinase NSK-SD®, the first nattokinase introduced into the US market, which has established standardization and quality levels for all other nattokinase. Our MicroChitosan contains small-size chitosan oligosaccharide, and our Prima Uña de Gato contains TOA-free Cat’s Claw. Taber’s Medical Dictionary defines “hypoallergenic” as: “Diminished potential for causing an allergic reaction”. We define hypoallergenic as “free of all common allergens”, specifically, wheat, corn, soy, gluten, yeast, dairy, eggs, fish, crustacean shellfish, tree nuts, and peanuts. Many very sensitive individuals who react to supplements in general are able to tolerate Allergy Research Group® products. Since our inception in 1979, we have used only the purest, and whenever possible, the lowest allergy potential natural ingredients. And while many of the nutrients in our formulas are synthesized from natural plant substances, which as a whole may contain antigens, the synthesizing process removes the molecules of the desired nutrient from the original substance, and in the processing, a great percentage of the antigens and allergens are left behind. The final material then has extremely low allergy potential. This is not to say that no one will react to any of our hypoallergenic formulas, as some extremely sensitive people may. However, the potential for an allergic reaction is low, and the feedback from many of our extremely allergic and sensitive customers is that Allergy Research Group® supplements are often the only products they are able to tolerate. The FDA requires manufacturers to identify the presence of eight major food allergens on all product labels: milk, egg, fish, Crustacean shellfish, tree nuts, peanuts, wheat, and soybeans, as well as any ingredient derived from those foods. When an ingredient may have been derived from a common allergen, we are required by law to list that allergen on the label as a source of the ingredient, even if it does not contain any of the actual substance. For example, 100%-pure glucosamine sulfate does not contain any actual shellfish, but we are required to indicate the source material (shrimp, crab, lobster) on the label. Allergy Research Group® fully discloses all ingredients, both active and inactive on every product label, so doctors can make fully informed choices for their patients’ nutritional support. Allergy Research Group has consistently pioneered new breakthroughs in nutritional supplements. Our in-house Research and Development team has decades of experience in formulating original and leading-edge products to support optimal health. Working with our certified manufacturers, we continue to develop technologies that maximize product delivery, absorbency, and effectiveness, such as micronized particles and lipid matrix release. ARG continues its tradition of innovation with some very exciting new products: Tocomin SupraBio® Pure Palm Tocotrienols (both 100 mg and 200 mg), NT Factor® EnergyLipids patent-pending phosphoglycolipids Powder and Chewables, along with several tableted NT Factor® formulas, Humic-Monolaurin Complex and Humic Acid, Icelandic Cod Liver Oil high in EPA/DHA, ProBerry-Amla® blended Berry and Fruit powder featuring Indian superfruit Amla, an expanded line of Natural Glandulars formulated by glandular expert Dr. Nicholas Gonzalez MD, Acetyl-Glutathione, Magnolia Extract (Honokiol + Magnolol 90%), truly balanced vitamin D formula Vitamin D3 Complete, and a low potency Ox Bile 125 mg. For more information on these new products, please see our New Products category. We continue to publish Allergy Research Group Focus newsletter, with ground-breaking analysis of research, and original nutritional ideas.